Jersey Jazzman's take on Cerf's interview with the Associated Press reminds me of a letter from the Cherry Hill Superintendent and School Board. They were responding to Pastor Amir Khan who wrote an editorial in which he reported that in Cherry Hill “the share of black children who failed the standardized eighth-grade language arts test was three times the corresponding share of white children.” Quite a dire situation, clearly a charter is warranted, STAT! Except that Dr. Reusche has actual data to back up the fact that Cherry Hill schools are improving educational outcomes for ALL of their kids. The Inquirer only ran a bit of her response mixed in with the other letters to the editor, while Pastor Khan got his own piece. On behalf of the students, staff, and parents of the Cherry Hill Public Schools, we take issue with a recent op-ed piece in which Pastor Amir Khan tossed out some test data with very little context. He reported that “the share of black children who failed the standardized eighth-grade language arts test was three times the corresponding share of white children” in Cherry Hill. First, let’s look at actual numbers. On the Spring 2011 NJ Assessment of Skills and Knowledge for Grade 8 (NJASK 8), 12 of 68 black students failed the test. Of the 12, four had been in the district for two years or less, including one who was new to the district in 2011. The 2011 scores for Grade 11 students show that only three of 62 black 11th graders failed the language arts High School Proficiency Assessment (HSPA) and one of those students was new to the district. In total, 95.2 % of black students in 11th grade were proficient or advanced proficient on the language arts HSPA. The progress Cherry Hill has made in narrowing the achievement gap between black and white students is best illustrated by a cohort analysis that examines student growth over time. For black students who took the NJASK as 8th graders in our district in 2008, and then took the HSPA as 11th graders here in 2011, language arts proficiency improved from 90% to 96%. For white students, proficiency improved from 95% to 98%. An achievement gap of 5 percentage points between black students and white students in 2008 had narrowed to 2 percentage points by 2011. Similarly, for black students who took the NJASK as 5th graders in 2008 and as 8th graders in 2011, language arts proficiency improved from 63% to 86%. For white students, proficiency improved from 82% to 94%. A gap of 19 percentage points between black and white 5th graders had narrowed to 8 percentage points by the time these same students were 8th graders. We are confident that the gap will continue to narrow - or even disappear - when these students take the HSPA in 2014. The results are clear: the data indicates the longer students stay in the Cherry Hill Public Schools, the better they achieve! Our demographics continue to change; in “relatively affluent” Cherry Hill, 17% of students are eligible for free or reduced price lunch. At eight of our 19 schools, the percentage is 24% or higher. At one of our elementary schools and one of our middle schools, one of every three children is eligible. The percentage of students who receive special education services has grown to 19%. We find it reckless, then, for Pastor Khan to state that Regis Academy will cost the Cherry Hill district “a mere 1 percent of its budget.” When it comes to taxpayer dollars, we can’t afford to be so cavalier. The $1.9 million we are required to set aside for Regis Academy’s projected enrollment of 169 Cherry Hill students is 64% of the total amount our budget will be allowed to grow under the state’s 2% levy cap. Governor Christie himself said recently that his preference is “that charter schools be put in failing school districts” (you can access the audio clip on our district website). The intent behind the charter school law was to provide a lifeline for students trapped in chronically failing school districts. No matter how you spin the test data, that isn’t Cherry Hill. Thank you Dr. Reusche for speaking out for your students with straight forward, no nonsense data that clearly demonstrates that Cherry Hill IS NOT FAILING black students. Rather, Pastor Khan was just throwing around the "F" word as supposed proof of "need" for his charter. Pesky suburbs with their facts. How many arguments for need could be deflated as easily as Dr. Reusche pops Regis Academy's bubble if districts were given the time to fully vet applications and charter applicants had to actually make their case to districts and communities, not just the Acting Commissioner? Maybe the reason his charter was approved has more to do with Pastor Khan's relationship to Rev. Reginald Jackson and the Black Ministers Council of New Jersey that meets regularly with Governor Christie? Is the suburban charter school battle Christie's Waterloo? With all of the holiday hubbub this segment almost escaped me. ON 12/22 WNYC's new Managing Editor for New Jersey Nancy Solomon and New Jersey native and WNYC investigative journalist Bob Hennelly participated in a discussion on the Brian Lehrer show called New Jersey Confirmation Battle. It was an intelligent discussion of the issues regarding Senator Rice's block of Acting Education Commissioner Chris Cerf's appointment. At no time was Senator Rice called a conspiracy theorist. Instead, Nancy Solomon detailed Cerf's long history of involvement with for-profit companies that contract with public school districts. "It's an ideological battle. Do you want your public schools business done publicly or do you want private hedge fund managers donating money and making decisions?" "When you put a guy in charge of public education whose total background is privatization, what the hell do you expect?" "The charter school issue is starting to really heat up big time in the suburbs, and suburban parents are really upset about money going to charter schools. They don’t want it, and money is going from the public budget for schools into charter schools and I think that could turn into Christie’s Waterloo." Congrats on your new job Nancy Solomon. Your analysis is exactly what New Jersey needs right now. We're working hard to keep the heat on. Please continue to help us do so. The districts identified in the application will have the opportunity to review applications and addenda, if applicable, and submit comments to the Commissioner. The comments of these district boards of education and/or state district superintendents must be forwarded by the district(s) to the Commissioner within 60 days of receipt of the applications and within 30 days of receipt of the addenda. This is also found in 6A:11-2.3 (f): The district boards of education or State district superintendents of the districts of residence of the proposed charter schools shall review the applications and addenda. 2. The recommendations of these district boards of education or State district superintendents shall be forwarded to the Commissioner within 30 days of receipt of the addenda. If the districts are afforded 30 days by law to respond to an addenda how can the decisions can be announced on the 17th? As you know, new information is often submitted in an addenda, and it is crucial for the districts and communities to have a chance to respond. It is also imperative that district and community comments receive a substantive review from your office before the commissioner makes his final decision. I already called Mr. Barra out on how "open, honest, and productive" the department's dialogue with districts and communities about proposed charters is, but this is far more outrageous. Please Mr. Barra, explain to me how the Acting Commissioner is going to be taking district and community responses to addenda "seriously" when they are due at 4:15 the day before he is announcing his decisions? Are we to believe that the Acting Commissioner will be pulling an all nighter on the 16th pouring over district responses? Doesn't it stand to reason that the decisions will already be made on the 16th, the day the community responses are due, by law, if the formal announcement is on the 17th? 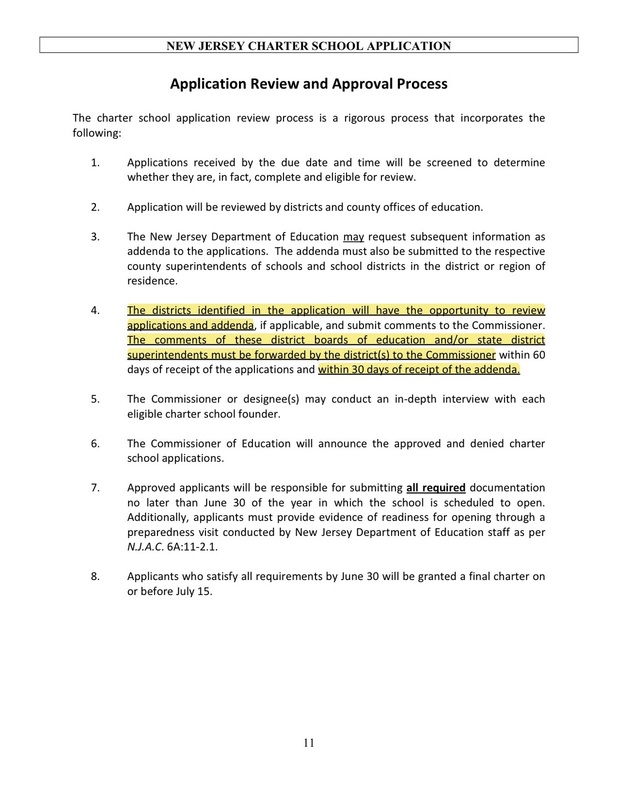 So forgive me if I remain skeptical that the NJDOE is taking district and community feedback into account when the Charter School Office has created a timeline that completely negates the opportunity districts are afforded, BY LAW, in the charter school application process. I have a thought or two about Neil Brown's guest opinion column. I am disappointed by what is said by many of those who will establish recently approved charters. When asked what is special about their school’s program, they often say something like: “We plan to hire high-quality teachers and have longer hours.” My former students would call that a “duh” statement — their fancy term for a tautology. All too often, proposed schools seem more like boutiques, catering to communities that demonstrate neither much need nor broad demand, while so many other communities are desperate for truly innovative schools. Rarely is anything proposed that is innovative or experimental, which circumvents the original charter school legislation’s intent. I am much more than disappointed Mr. Brown. That the boutique charters getting approved are not "special" is the tip of the iceberg. In an earlier post I shared my Senate Education Committee testimony. I was truly disheartened to be steam rolled by lobbyists in crisp suits with shiny brochures as I and other parents from across the state tried to explain to the Education Committee the effect the current legislation is having on our districts. All of the lobbyists against the legislation Save Our Schools NJ is fighting for are bought and paid for by big foundations like the Walton Foundation whose "core strategy is to infuse competitive pressure into America’s K-12 education system." While this may not have been the initial intention of charter legislation, that's who is impacting the legislative agenda now. If you are truly paying attention to what's happening with charter schools in New Jersey you can't help but be genuinely dismayed. Please see my previous post about the for profit charter operator already getting a foothold in New Jersey. Please also read the numerous letters here and here and here from increasingly frustrated superintendents tired of receiving huge bills for charters they feel are not warranted in their districts. 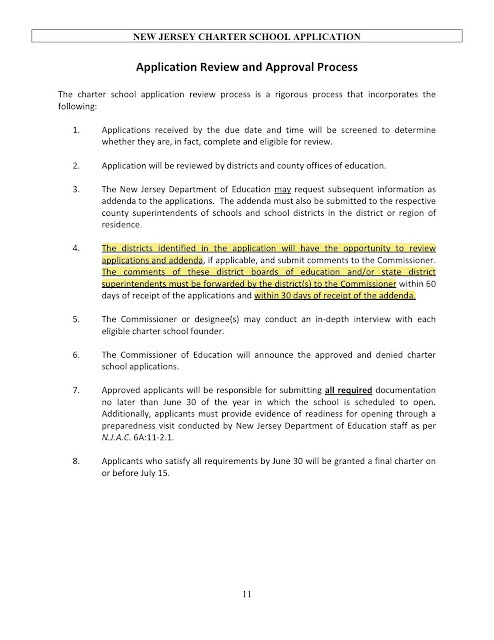 The other common themes are that local district and community wishes are ignored in the application process, and real problems with applications are being ignored too in the NJDOE's charter approval process. Did you know that in the last round paid national consultants led teams of NJDOE employees in reviewing applications? Of course this was only revealed after a lawsuit and several OPRA requests. Are you seeing the pattern? The same national lobbyists that are pushing for legislation are reviewing the applications. Gee, that just doesn't seem right now does it? And this is your best argument against local control legislation that will take these decisions away from national lobbyists with corporate agendas and put the power back in the hands of the people of New Jersey? Unless residents are privy to a proposed school’s mission statement and curriculum, how can they possibly make an informed decision? They can’t. Given our traditionally low voter turnout, the problem is compounded. You don't think voters could grasp the mission of a proposed charter yet they can vote on multi-million dollar budgets? And why do residents have to be privy to the curriculum? In the current application process a completed curriculum isn't even a requirement. If the Acting Commissioner doesn't need to see the schools curriculum before giving a school the thumbs up or down, why is this a reasonable argument against the voters getting to decide? And if low voter turnout is one of your reasons, hell, why do we vote on anything? You definitely need stronger arguments here Mr. Brown. Local control legislation sounds a lot more reasonable than a system where the Acting Commissioner gets to make the decisions but the districts and taxpayers get to foot the bills. You don't find THAT disappointing? The more than 4,200 people that signed the Save Our School NJ petition for local control are distressed that not only do they have no say in how their district's money is being spent, they are almost entirely shut out of the application process. The charter proposal you are working on for homeless children and children of incarcerated parents sounds noble, but why shouldn't district schools have the funding and ability to service these children without taking much needed funding away from the rest of the children that will be left behind in the district schools? And while I agree that the state should reevaluate the original intent of the charter school law, it is abundantly clear that the players with money and influence have no intention of time traveling back to 1995. Our state is on an entirely different trajectory. Tom Moran's editorial today is preposterous. I am not an investigative journalist, but with just a bit of careful reading it's pretty easy to see the handwriting on the wall. Allow me to illustrate. Last month I noticed a story out of St. Lois, MO about Imagine Schools, the largest for profit charter management chain in the country. Imagine Schools operates 75 schools in 12 states and the District of Columbia. As a full-service charter school operator, Imagine is basically a multi-state “school district” educating approximately 40,000 students (about the same size as the Newark public school system, while larger than Cincinnati, Minneapolis, or Buffalo). Their St. Lois schools are failing - big time. So much so the mayor called for every single school they operate in his city to be shut down. Imagine not only operates the schools, they also make a killing buying, selling and leasing the facilities that their charters occupy. They have a whole separate arm of their business that handles these transactions called Schoolhouse Finance. Such an innocuous sounding name, isn't it? Conjures up images of a little red schoolhouse in the middle of a prairie. The charter school operator Imagine Schools has placed a top executive on administrative leave and has received a stern warning from the sponsor of its St. Louis schools, following revelations about the company's financial dealings. Top officials at Missouri Baptist University met this week with Dennis Bakke, chief executive of Imagine Schools, for a "candid and honest discussion" about the university's relationship with the company, said university spokesman Bryce Chapman. Findings about Imagine's St. Louis real estate and contractor dealings in recent days are 'serious" and "need to be investigated." Chapman said. Bakke has been in town this week giving Imagine's six underperforming charter schools in the city extra attention and support after a Post-Dispatch series showed them to be entangled in complex real estate dealings that have contributed to high rent payments while classrooms lacked basics such as textbooks. Among the proposals were some with ties to out-of-state charter school networks, like Imagine Schools, which helped local residents write applications in Jersey City, Newark, Camden, Trenton. Imagine serves 40,000 students in 72 schools in 12 states, according to its website. "New Jersey is an area that is favorable for (education) alternatives," Samuel Howard, Imagine School’s executive vice president, said. 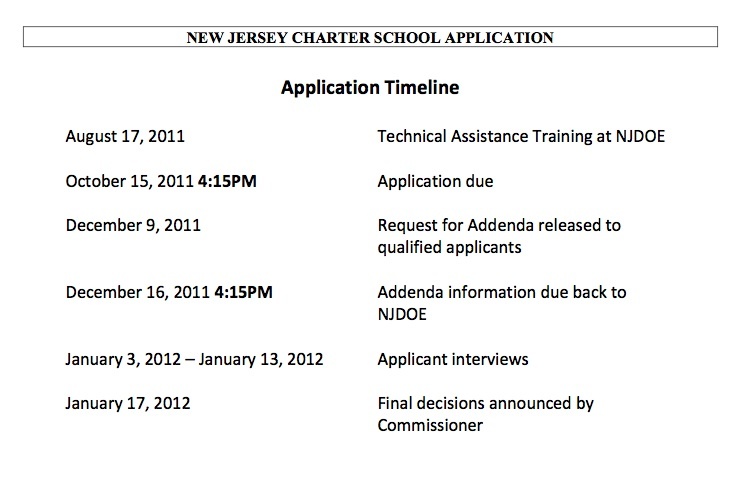 Gee, Rice is looking less and less like a conspiracy theorist now… here is proof from the Star Ledger that the largest for-profit charter operator in the country has already helped write and submit four applications in urban districts, one of which is Rice's. Notice who the quote is from? Yup, our buddy Samuel Howard who has been placed on leave for allegedly taking kickbacks in Imagine's real estate dealings in St. Louis. Interesting that Imagine is finding New Jersey "favorable for (education) alternatives." In April 2006, when Willis announced he wanted to start a charter school, Imagine Schools Inc. was already on site and involved – a year before the board would have its first meeting. In September of that year, Imagine-Fort Wayne Charter School Inc. was formed, allegedly the local organization that would start the school and contract with Imagine Schools Inc. of Virginia to run it. But the contact person for the non-profit Imagine-Fort Wayne Charter School was Imagine Schools Inc.’s executive vice president, Jason Bryant, and the corporation’s address was Bryant’s house in Fort Wayne. The incorporator was Imagine Schools’ attorney, Joseph Miller, of Baker & Daniels in Indianapolis. Two months later, the local non-profit filed for tax-exempt status with the IRS – the paperwork was again handled by Miller – and signed a contract with Imagine Schools Inc. The contract was signed by Willis; board members never publicly discussed it or voted on it, as it would be five months before their first meeting. Instead, they signed a resolution that claims it has the same authority as if it had been approved unanimously by the board at a public meeting. Indiana Public Access Counselor Andrew Kossack said there is no provision in the state’s Open Meetings Act that would allow such action. State law requires all public bodies to take all official action during public meetings. Mr. Moran, I ask you to look into whether any of the four Imagine backed applications made it through last October's round of applications. Like I said, I am not an investigative journalist, just a nosy mom trying to protect her kid's schools. Unlike Governor Christie and Acting Commissioner Cerf, I do not want to see for profit charter networks that are unaccountable to taxpayers "outsource the operation" of ANY kid's school, thank you very much. I just can't let Justin Barra's statement to Gannett Statehouse reporter Michael Symons regarding my meeting with Acting Commissioner Cerf go unanswered. Department of Education spokesman Justin Barra said acting Education Commissioner Christopher Cerf met in August with Cimarusti and others from Highland Park, who were opposed to the proposed Tikun Olam Hebrew Language Charter High School, which has been denied three times but has reapplied. While I did meet with the Acting Commissioner, Barra's characterization of the meeting is entirely disingenuous. I met with him, Carly Bolger, soon-to-be-ex Director of the Charter School Office, and Chief of Staff and former Commissioner David Hespe in August. Also in attendance were other concerned parents from East Brunswick, Princeton and South Brunswick who feel shut out of the process, as well as one other parent from Highland Park. This meeting was NOT about Tikun Olam, the charter school I am opposing. It was in response to two women, Liz Lempert from Princeton and Lisa Rodgers-Grieco of South Brunswick, attempting to hand deliver a petition to Acting Commissioner Cerf. Alan Guenther, the director of communications accepted the petition, not Cerf. The petition asked the Acting Commissioner not to approve an additional planning year to the Princeton International Academy Charter School (PIACS) in Princeton. The Acting Commissioner did not listen to the voices of those 1200 residents and granted PIACS their second planning year. Liz and Lisa continued to follow up and request a meeting, which was granted only after much persistence on the part of these women. They asked representatives from Highland Park and East Brunswick to also attend as our districts have been very outspoken on this issue. The meeting was cancelled by the Acting Commissioner when PIACS sued the affected districts stating that they were using public funds to object to their charter. The meeting was rescheduled only after much persistence and multiple assurances that discussion of PIACS would be off the table. There was little to no discussion about individual charters at this meeting, instead it was about broad overarching issues related to the lack of community involvement in the charter application process. 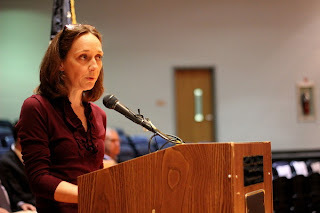 At one point when I attempted to discuss specifics of the Tikun Olam charter application Ms. Bolger became agitated and threatened to end the meeting. What we are asking for is an equal say in the application process. While we fight for legislation that would give voters a say, we are demanding that the DOE have open discussions about pending charters with districts and communities. From January 3-13 to DOE will conduct interviews with applicants, but there are no such meetings for the effected districts or communities to discuss specific charters. That is what we are asking for, and that is what the NJDOE is refusing to provide. "an open, honest, and productive dialogue about proposed charter applications"?? Really Mr. Barra? Then why do I need all of these elected officials in suits backing me up to try to get my voice heard? 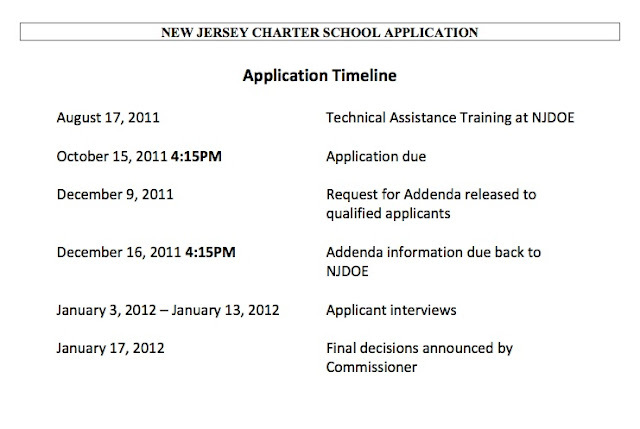 And why didn't ANYONE from the NJDOE come to the meeting despite numerous requests? The Acting Commissioner is approving charters against the wishes of communities and is not meeting with those communities to discuss the applications or the approvals; ONLY the applicants. Just look at East Brunswick and Cherry Hill for examples. For them to say they take community or district input into account would be laughable if it weren't so destructive and misleading. Here's a good launching point to give you some background on not only the situation here in Highland Park, but how it ties into the "big picture." Below is the testimony I presented to the Senate Education Committee when Senator Ruiz held a hearing on several pieces of pending charter legislation, including Senate Bill 2243, which would require voter or board of ed approval before charters could open in a district. This would solve so may of the problems we are facing here in Highland Park, and I was honored to testify about our experience. I testified alongside other organizers from Save Our Schools NJ, a grassroots organization that advocates for public schools, specifically on charters, vouchers and the funding formula. The Walton Foundation spent $157,220,283 in 2010 alone "to infuse competitive pressure into America’s K-12 education system." While these lobbying groups may be called "New Jersey" this, or "National" that, they are all CORPORATE reformers. Make no mistake about it. Their agenda has nothing to do with what's good for this state or this country. It has to do with what's good for them and the foundations that support them. Good morning Senators. I am here to talk about the need for local control over charter schools in our state. I am from Highland Park, a small, diverse district with four schools that educate 1300 students. Over 50 languages are spoken in the homes of our district. We currently send students to two charters, Greater Brunswick Charter School in New Brunswick, which follows a Montessori philosophy, and Hatikvah International Academy Charter School in East Brunswick, which is a Hebrew Language Immersion Elementary School. We are also faced with an application for a third charter, Tikun Olam Hebrew Language Charter High School. Currently eighteen Highland Park students attend Greater Brunswick in grades K-6 and five students attend Hatikvah in grades K-3. For these 23 students Highland Park pays $352,208 in tuition and transportation costs. This is roughly equivalent to the salary of six teachers. I ask you, when we lose 23 students spread over seven grades, how are we to cut six teachers to absorb the subsequent loss of funding? Highland Park ranks among the top 200 high schools in the country, has a graduation rate of 100% and 98% of our students go on to college. It’s therefore important to look at whether Highland Park student’s needs are being met as successfully when they leave our schools. The 2010 No Child Left Behind School Report Cards for Highland Park and Greater Brunswick reveal that almost five times more kids in Highland Park are scoring Advanced Proficient in Math and Language Arts than at Greater Brunswick. New Brunswick is the host district for Greater Brunswick, and pays $3,625,000 for 241 students to attend. While New Brunswick has far more ELL and almost twice as many Free Lunch students, their test scores in Language Arts are roughly equivalent to those of Greater Brunswick. However, Greater Brunswick fairs far worse in Math. Almost twice as many New Brunswick students scored advanced proficient in Math than Greater Brunswick students. I ask you, why is Greater Brunswick allowed to take funds from public schools when they aren’t meeting their student’s needs as successfully as the public school districts and are serving significantly less ELL and Free Lunch students than their host district? There are also significant concerns that Hebrew Language Immersion schools are not intended to serve our diverse public school population. Of the four children from Highland Park who enrolled in Hatikvah last year two enrolled in the district only to immediately transfer to Hatikvah, without ever sitting in a public school classroom. There is evidence that Hatikvah failed to report to the state that students were transferring from private schools. If children transfer from private schools to a charter the state is responsible for paying the first year’s tuition, not the district. I ask you, when students attending charter schools have never stepped foot in a public school classroom, how can we say that charters are meeting an unmet need in the public schools? There is legitimate concern that these are not isolated cases and that if Tikun Olam is approved many students would come from private Jewish schools, not public schools. In fact, the lead and qualifying founder, who is from Highland Park, does not send her own children to our public schools, she sends them to a private yeshiva. According to New Jersey Charter School Law the lead and qualifying founder is ineligible to found a charter school, as is the Edison qualifying founder. The law clearly states that charters may be established by teaching staff members, parents with children attending the schools of the district, or a combination of teaching staff members and parents. Neither qualifying founder is a teacher and the superintendents in both school districts confirmed that neither has children enrolled in their public school districts. The founder’s ineligibility was overlooked by the Department of Education in two application cycles, only to be uncovered by members of our community in the third application. This raises troubling questions regarding the DOE’s lack of oversight of the charter application review process. There is no evidence that the DOE has acknowledged that the founders are ineligible to apply for a charter. In fact less than one week after the DOE denied Tikun Olam for the third time, the United States Department of Education awarded Tikun Olam a $200,000 grant to plan their curriculum and open their doors. I ask you, when founders of charter schools are not parents of public school children, how are charters like the proposed Tikun Olam offering “parents another high-quality public school alternative” and not a publically funded private school education? Members of the Highland Park community have collected over 2100 petition signatures and 600 letters of opposition to Tikun Olam. These have been delivered to the DOE and I have copies here for your review. Our elected officials oppose Tikun Olam as well. Our school board, Borough Council, Mayor, Freeholders, Assemblymen and Senator have all been outspoken about the need for local control over charter schools. I ask you, when less than 2% of Highland Park public school students leave for two charter schools does that demonstrate an unmet need in our district? I ask you, why shouldn’t the parents of 98% of Highland Park public school students get to decide if we think it’s worth the price we will pay to finance charter schools in our district? I ask you, why shouldn’t we have local control? So, who is this lady anyway? I didn't know her before March of 2011 either, but strangely enough, it's me. That's when I went to my first meeting about the opposition to the third application of the Tikun Olam Hebrew Language Charter High School in my hometown of Highland Park, NJ. On my way out the door I remember turning to my husband and saying, "I'm afraid if I go to this meeting I'm going to get more involved in this than I want to." Damn, was I ever right. 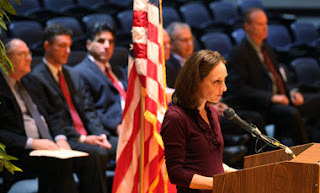 Now less than 9 months later I am helping to plan to Occupy the New Jersey Department of Education (NJDOE). How did I go from "mom" to "Mother Crusader" in this short time? I'm hoping to use this blog to detail the things I have learned along the way, and how the goings on in tiny little Highland Park, NJ exemplify some of the more troubling aspects of the big ed reform debate swirling around our state and our country.